Meet Blue, one of nine blue whales that perished in thick sea ice off the coast of Newfoundland in 2014. Two of these whales washed ashore, and the ROM team salvaged the body that landed at Trout River. After years of preparation, Blue’s skeleton is now part of an amazing exhibition all about the biology, history, and conservation of whales. After a great video introduction to Trout River, and stories about how the ROM collected such a massive specimen, we’re treated to a dramatic view of Blue’s real skeleton. In the background, huge video projections of living blue whales swim by. 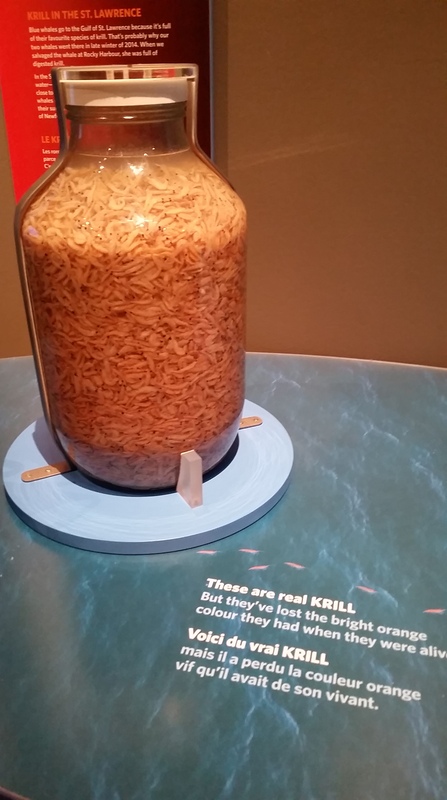 The ROM didn’t just keep Blue’s bones – we also get a chance to step inside a replica of her mouth and see how the real baleen plates would have looked to a krill. (There’s even krill costumes for kids to put on!) Later this year, we’ll get a chance to see Blue’s real plastinated heart. The exhibit covers all kinds of amazing aspects of whale biology that I can’t possibly cover in just one blog post – vocalizations, mass, how long they can hold their breath, circulation, reproduction, raising young – you name it, it’s here. I especially like this comparison of models of Blue’s brain (middle), a human’s (right), and a sauropod dinosaur’s (left). Despite the similar body size, sauropods just can’t measure up to a huge cetacean. 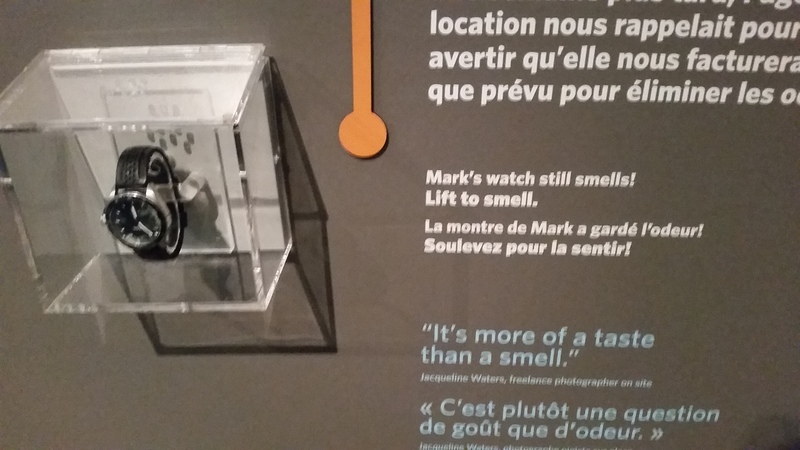 Regular readers will no doubt have noticed that I am a complete sucker for touchable objects and replicas in exhibits. 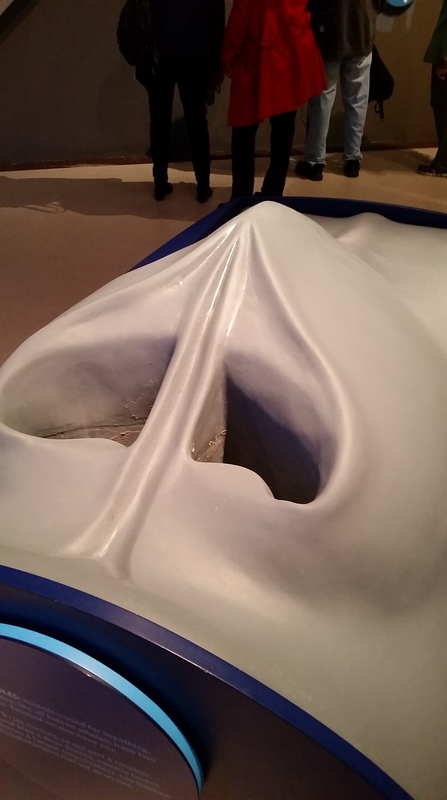 How delightful to have a replica of a blue whale’s blowhole as part of this exhibit – simultaneously familiar and gross, I just love it. I also liked this pair of displays: on the left, what goes into a blue whale’s mouth, and on the right, what comes out the other side. I’ve noticed that genetics research is often omitted from museum exhibits, probably because it’s harder to find tangible objects to display, and because it’s a newer field of study that wasn’t part of the traditional museum repertoire. ROM researchers are studying Blue’s genome, so I was really glad to see genetics incorporated into the exhibit via touchscreen interactives. 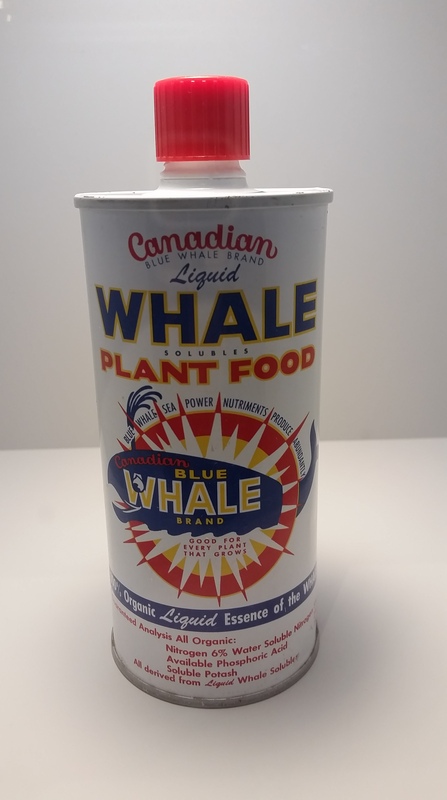 You spin through a genome ‘wheel’ and select areas that tell you about unique whale adaptations – this one about reduced taste and smell was particularly cool. Elsewhere in this nicely-rounded exhibit, we get to learn about the evolution of whales from their terrestrial artiodactyl ancestors! And it’s not just lip service, either – we get an interactive screen talking about how to interpret evolutionary trees, and multiple full mounted skeletons showing the relatively well understood sequence of changes from Pakicetus to modern whales. 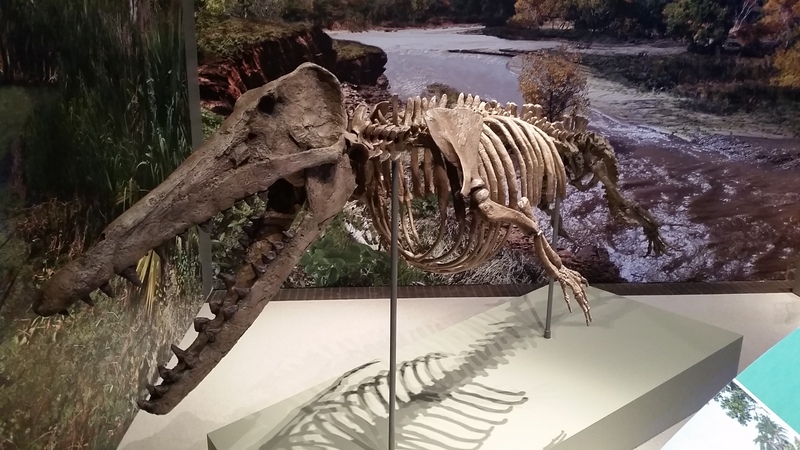 Here’s the classic walking whale that swims, Ambulocetus natans. The exhibit ends with a discussion of the history of whaling, threats whales face today, and current cetacean conservation efforts. This is a great way to draw on the ROM’s strengths as both a natural history and world cultures museum, and so we get to see some amazing artifacts from the days where it was totally normal to grind up blue whales to make your flowers look nicer. Makes me think about what people 50 or 100 years from now will be horrified by from my generation. One last photo which tragically cannot convey the full impact of this display. Out of the Depths: The Blue Whale Story is on exhibit at the Royal Ontario Museum until September 4th, 2017. It’s really great and totally worth checking out if you’re in Toronto over the next few months. Have you had a chance to see Blue for yourself? Let me know what you thought in the comments! ← Zuul makes an appearance at #FNLROM!